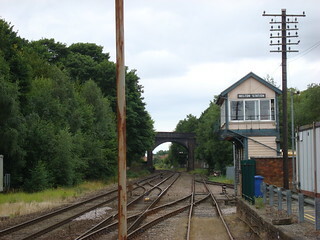 A photo of Melton Mowbray signal box, and a fine bridge over the railway, taken while waiting for the steam train. As the day of the ‘Melton Rambler’ and ‘Harringworth Shuttle’ railtours, Saturday 12th August was the cornerstone of the trip. Sadly, soon before the holiday it emerged that GWR number 4965 ‘Rood Ashton Hall’ had been replaced as the booked loco on both these trains, and the Shakespeare Express the day after, by castle class loco 5043 ‘Earl of Mount Edgcumbe’. Normally, I would be thrilled with the opportunity to see a ‘Castle’ but 5043 has a Hawksworth tender which in my opinion doesn’t really fit the GWR style so I had been really keen to see the Hall. Oh well, at least the castle is a GWR loco, and in any case the real highlight of the Saturday trains was the fact that pannier tank 9600 would be in use. My first opportunity to see the ‘Melton Rambler’ tour was at Leicester station. Unfortunately, as my grandmother and I entered the station we found that a long queue had formed at the ticket office. Once again, ticket barriers are a right nuisance, as I assumed they would be in operation and set off to walk around the station looking for a view leaving her to queue for our tickets (7-day East Midlands Rovers). I heard the steam train come through alright, the whistles are a dead giveaway, but by the time I had found a bridge overlooking the railway it had passed. I did however see it in the distance, already parked in the siding north of Leicester station that it was booked to wait in for about an hour. Back at the station, with tickets secured, we descended to the platforms and took CrossCountry Turbostar 170637 to Melton Mowbray (the 10:18 departure from Leicester to Stansted Airport), overtaking the parked steam train. 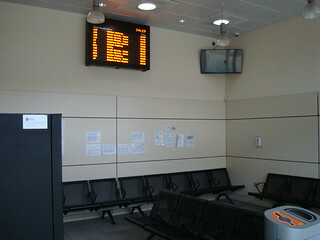 Melton Mowbray station appeared to possess a ticket office and waiting room, but both were locked shut. A note in the window of the former said that it may be closed due to staff unavailability, but the opening times were not particularly extensive anyway (Monday-Saturday mornings only). We soon decided to change our plan, which had been to head west to a point where my grandmother thought I might be able to video and photograph the incoming steam train. That idea was ditched because neither of us had been able to see if the spot was suitable from the Turbostar. 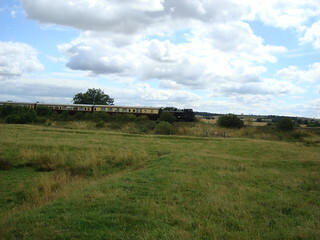 Instead I recorded the steam locomotives double-heading the ‘Melton Rambler’ into Melton Mowbray station. It arrived several minutes after its 11:15 due time. As the empty stock headed off into a siding (where it would wait until it was time for the ‘Harringworth Shuttle’, due off Melton Mowbray at 12:45) my grandmother and I went in search of the town’s bus station. We were eventually directed to a street with a number of bus stops, but there was no sign of the number 56 bus we were after. A driver told us we would find it on a different street and gave us directions. It wasn’t far, but we had taken so long to find the first place that I had my doubts about getting there by the bus’ 11:50 departure time. Fortunately we made it and purchased a Centrebus day ticket on-board; but I forgot to take a note of the vehicle’s registration number. Wyfordby Top: a farm in the Leicestershire countryside, seen from the point we alighted the bus. 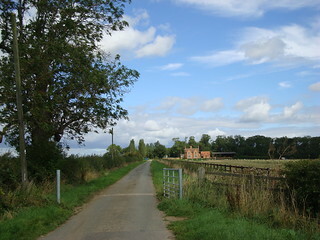 The road to Wyfordby is behind the camera. Our stop was ‘Wyfordby Top’, so called because it isn’t really in Wyfordby but at the top of a road leading downhill to the hamlet. There was no sign or shelter to indicate that buses would stop either, but stop it did and we got off and walked down to Wyfordby. Technically this is still Leicestershire, not Rutland, but bear with me. Here my grandmother spotted a field which turned out to be an even better location for viewing the ‘Harringworth Shuttle’ than the spot a little further along the road (near a level crossing that is still worked by hand by a member of staff) I had identified on Google Earth. Wyfordby steam: Pannier tank 9600 on the rear of the outbound ‘Harringworth shuttle’. The steam train was scheduled to reach Saxby (east of Wyfordby) at 12:51, with our next bus due to pass Wyfordby Top at 13:05. The steam train, now hauled by ‘Earl of Mount Edgcumbe’ alone with the Pannier having been shunted to the rear, however did not show up on time (the Real Time Trains website now informs me that it left Melton Mowbray 9 minutes late) so it was a rather anxious few minutes. At about 13:05 we were still on our way back up the hill and I expected to see our bus rush past, which would have left us stranded for at least an hour (probably longer). In the event the bus was late, and we were left standing by the roadside for several minutes before it finally turned up. This second bus (again, I forgot to get the reg. 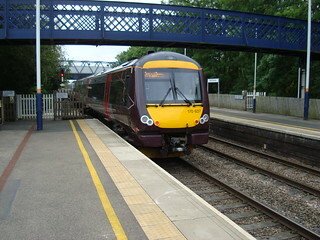 number) was running a different route, the RF2 (Rutland Flyer 2). As the name suggests, this took us across the border into Rutland. My plan was to take this to its final destination of Oakham and pickup a number 19 bus from there to Ashwell where I hoped to see the return leg of the steam service. The problem was that the connection time in Oakham was 10 minutes, so while the delay to the RF2 bus was fortunate in that we were not left stuck in Wyfordby it did make missing the connection at Oakham a very real possibility. The RF2 took us via a very interesting (though indirect) route through several rather pretty villages with the odd thatched house. It also drove through a gate guarded by a soldier armed with an SA80 assault rifle. I don’t think I’ve ever been on a bus that has done that before. The reason for the guard appeared to be that this was the barracks area for RAF Cottesmore, although we were only inside very briefly as the bus turned round just inside the gates and headed back out. The various interesting sightings and the breeze from the open windows made this a rather nice bus ride. 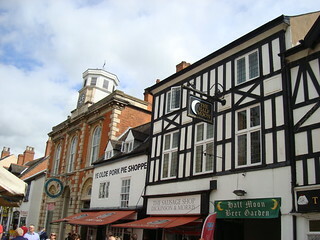 Eventually we made it to Oakham but the number 19 bus, due at 14:05, had already departed. Abysmal timekeeping from the so-called ‘Flyer’ then. Waiting room: Oakham seems to have the right idea about how to cater for public transport interchange. 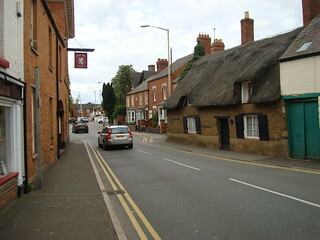 A slight consolation was that the destruction of my plan to get to Ashwell gave us some time to see a little of Oakham. The bus station was one of the best I’ve seen as it was fully equipped with a waiting room and toilets, both seemingly brand new. I wonder if they are open all hours though, unlike the facilities at Carmarthen bus station (the only other I can think of that has a waiting room) which, if you are waiting for an evening bus, may be closed. 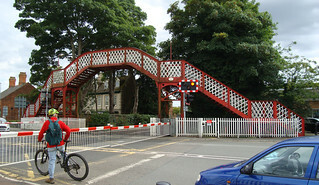 Near the station in Oakham is a level crossing next to which is a good-looking footbridge in traditional style. It doesn’t look like a modern structure, yet it is much higher than otherwise similar footbridges elsewhere with sufficient clearance for the large containers carried on the intermodal trains that seem to pass through here quite frequently (we saw a few over the course of the day at Melton Mowbray and in Oakham). I even commented that it looked like there was sufficient clearance for overhead line electrification, not that electrification of this line has ever been promised. From the station we walked north in the hope of finding somewhere we could get a good view of the Pannier hauling the return ‘Harringworth shuttle’, but it came past us before we succeeded. 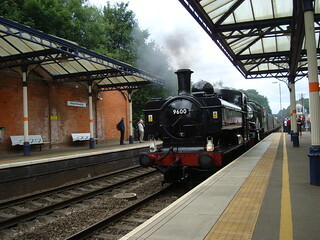 We then walked back to Oakham station for a Turbostar back to Leicester, passing the steam train at Melton Mowbray. As with both buses, I forgot to photograph this train or get the number, sorry. As scheduled, the return ‘Melton Rambler’, still with the Pannier on the front and the Castle on the rear, paused in the sidings north of Leicester. 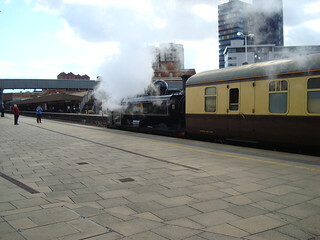 After a long wait, it came through Leicester station giving us our last view of the train.